Sometimes I feel like the most brilliant mother ever, and this day was one of them. First of all, our downtown library has the most amazing children's library I've ever been to. They have everything! It's a separate section of the library, so children don't have to be quiet. They have a play area with toys that encourage learning and problem solving - things like blocks and magnatiles. They have computers and ipads and lots of comfortable places to sit and a super easy self checkout system. But my kids think the best part is the book return. It's a conveyer belt with a door that automatically opens and you feed the books into. They jump up and down with excitement and argue over who gets to put the books in the slot. But it's the next part that had me patting myself on the back. When is the best time to take kids to a restaurant for lunch? When they have a whole stack of new books from the library. I hardly heard a peep out of them. 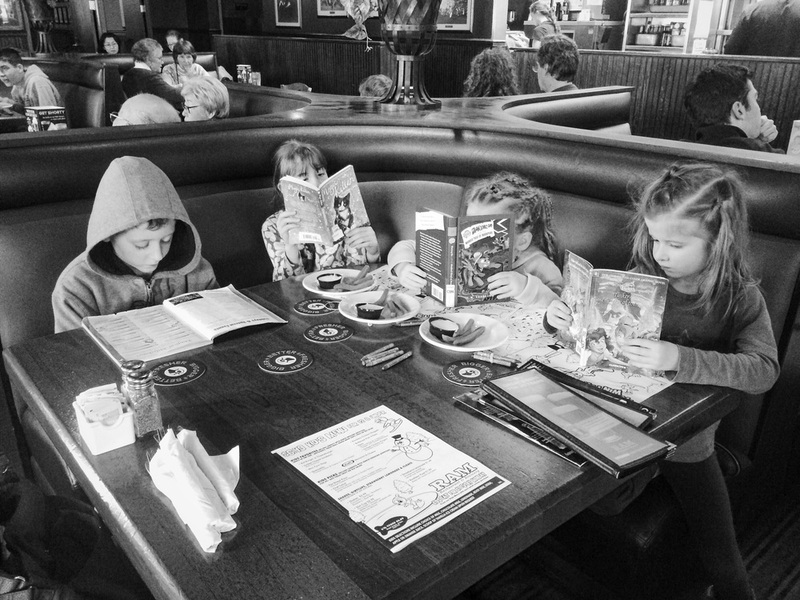 They had their noses in books until their food came, they scarfed their meals so they could get back to their books, and then they read again until it was time to go. Brilliant! It was the quietest restaurant meal I think I've ever had. This child would prefer to remain in her birthday suit at all times. But that doesn't work so well for school when it's 38 degrees and raining. Every day it's a struggle for me to get her to get dressed. She comes up with every possible stall tactic in the book. 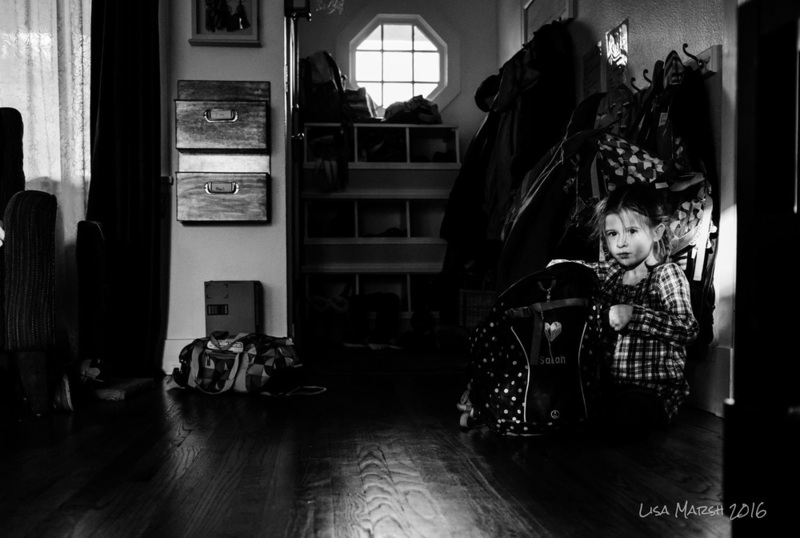 Getting ready for school on a rare sunny winter morning. It's early still, but we have light shining through the house that we haven't seen in a while - during this wettest winter on record. 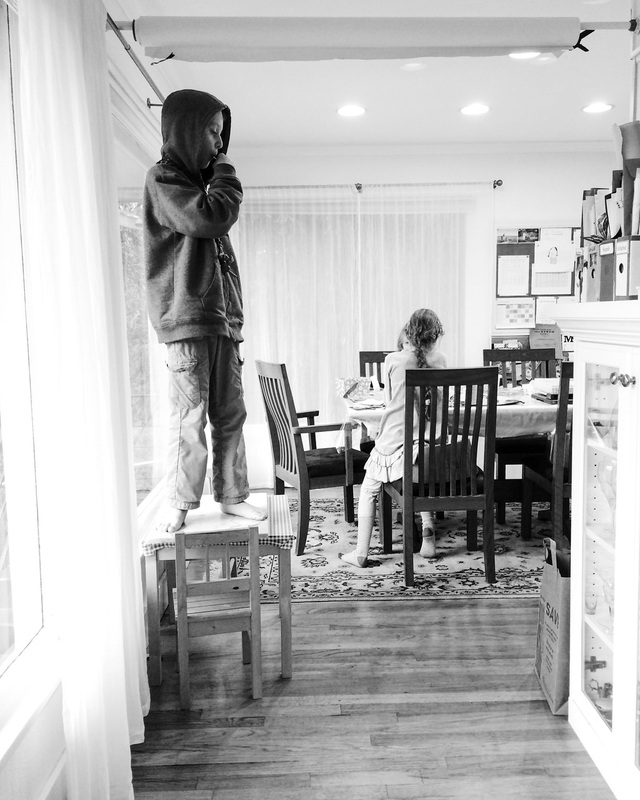 Oh, just standing on a table, eating a lollipop. Me: "Danny, get down from there!" Him: "But you let Chopper do it!" Me: "Yes, but you're not a cat." Laundry actually isn't one of my kids' chores. They do take turns with the chore of getting the laundry baskets to the laundry room, but I generally do the laundry. But this little child has been kissing up to mommy a lot lately. In a house of four kids they are always coming up with new ways to get undivided attention, and her latest tactic is to be as sweet as pie. She snuggles up to me, pets and kisses my hand, and says she would love to help me do my jobs. So this day I took her up on it, and took her to the laundry room to do some laundry.